Push, glide, swing your arms. Those were the skills I worked on while ice skating in the Rocky Mountains last winter. I didn’t come close to mastering them, but I did eventually manage to make my way around a huge outdoor rink without falling down or crashing into the snowbank piled around the rink’s perimeter. The downside to that experience was missing the chance to skate right here in Cookeville at our first-ever “Downtown Ice” event. I wasn’t going to let that happen in 2016. On the evening of December 29, which just so happened to be my birthday, I found myself in the empty lot across from the Cookeville Fire Department. That’s where the skating rink and two inflatable slides were set up. I paid my five dollars, which included skate rental and as much time as I wanted in the rink, and headed to the table where they were handing out skates. Because half sizes weren’t available, I opted for an 8 over my usual 7 ½. 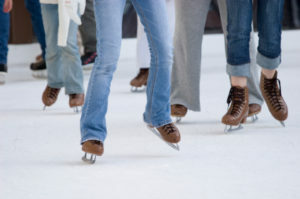 But when I put the skates on and stood up on the rubber pad, both ankles flopped over. “You better try a 7,” the girl at the table said, “and lace them up tight.” I did, while Mayor Ricky Shelton and Leisure Services Director Rick Woods looked on. I gingerly made my way to the “ice,” which wasn’t really ice at all but lubricated polymer. Greased plastic, in other words. Thankfully, only a handful of other skaters were in the rink, most of them holding onto the rail around the perimeter. “Push, glide, swing your arms,” I whispered to myself, trying to regain just a fraction of the muscle memory I acquired a year ago. But somehow it just wouldn’t come back. Despite tightly-laced, too-small skates, my ankles continued to flop. All I could do was take mincing little steps while clinging to the rail. It didn’t take long to figure out why. You can’t make a metal blade dig into plastic. Meaning that you can’t really ice skate on a polymer surface, even if it’s lubricated. This not-so-brilliant insight was confirmed by a young man standing in the middle of the rink wearing hockey skates and a knitted Green Bay Packers cap. One trip around the 40×60-foot rink was enough. Mayor Shelton was waiting for me at the exit gate. “Next year,” he said, “we hope to have real ice for this event.” I told him I thought that would be fun. And I assured him that offering even a plastic skating experience in Cookeville, Tennessee is wonderfully cool and ambitious. It’s just one more reason I’m proud to be from here.